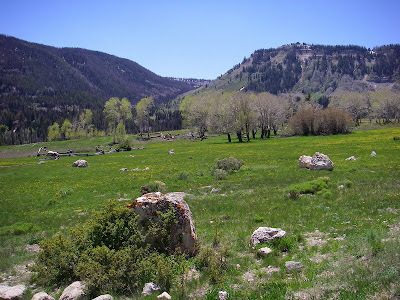 In central Utah nestled in the heart of the Wasatch Plateau lies an area known as Joe's Valley. Aside from the main attraction, Joe's Valley Reservoir, there are quite a few smaller puddles up various canyons nearby. 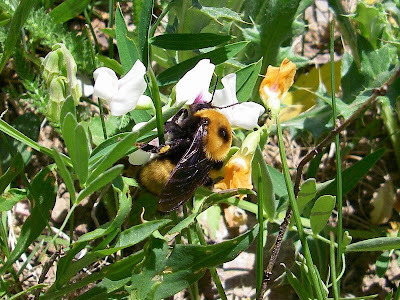 Taking Hwy 29 up Straight Canyon and west of the big lake, the road travels up Olsen Canyon and turns to gravel, climbing in elevation rapidly by way of switchbacks. ATV's are quite common in this area and all blind corners should be taken with care. After the first set of switchbacks have passed and the road travels deeper into the canyon, be on the lookout for a road cutting off to the right (north). 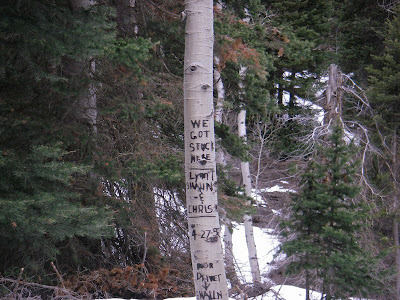 There's also a sign that reads, "Grassy Lake". Snowdrifts can keep this road blocked well into the warmer months and I've come to a wall of snow blocking my path on more than one occasion. This road usually opens up by mid June. 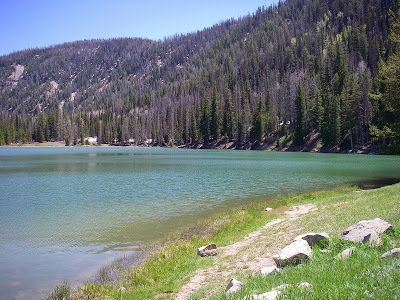 Once the road blocks have sufficiently melted away, a pleasant drive through aspens and meadows will bring Grassy Lake to the left, against the mountainside. 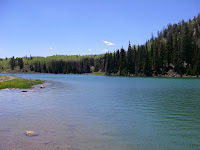 Softly hued aquamarine water glows in the daylight while rainbow and tiger trout ripple the surface. 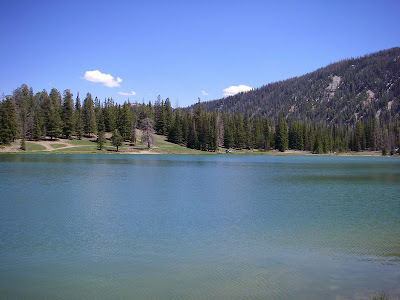 My first experience with Grassy Lake was quite nice as the eager fish were willing to bite just about everything I showed them. 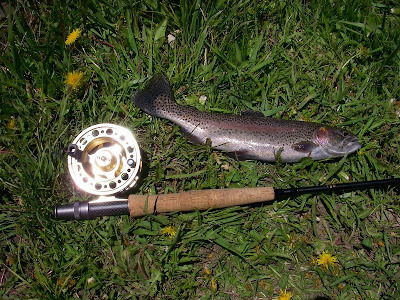 The fishing was so good that I pulled out my fly rod, which I had never caught a fish with. It didn't take long here. The rainbows were slightly larger than the typical planters and the tigers were rather small. Any lure seemed to work, but the best action came from my go-to Blue Fox Vibrax #2 in gold and an olive egg sucking leach. A small red brassy also got a few. 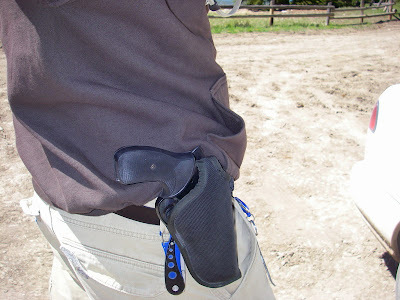 Other trips to the lake provided similar experiences. The excellent fishing only added to the beauty of this place and I found it hard to leave as other waters in the area called my name. Future trips to Grassy will include my float tube to explore the deeper end. Perhaps some surprises can be found with the right persuasion. 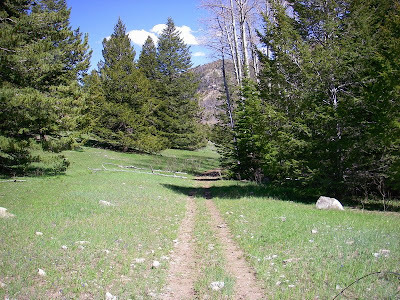 The road to Grassy continues back to the upper reaches of a small canyon where Littles Creek originates. 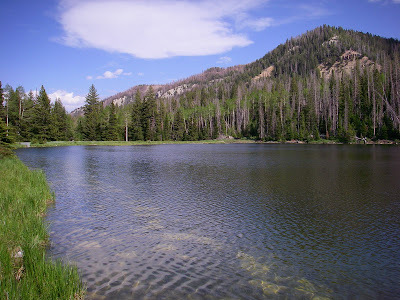 There's a gate about 1/4 mile up that stays locked into the summertime, but an easy hike along the dirt road can provide a more intimate journey to the next lake up the road. While hiking the road one time, I was able to notice a hidden gem tucked back in the trees a bit. 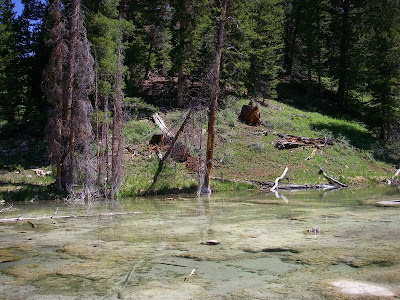 A seeping spring forms a shallow pond about 1000 feet up from the gate and off to the right. 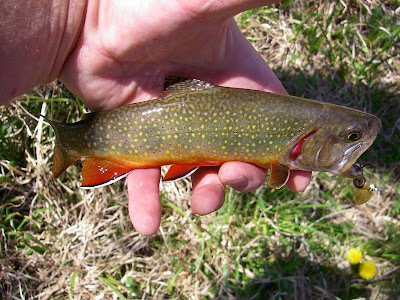 Though it's rather small and only a couple of feet deep, this puddle of water somehow sustains a population of vibrantly colored brookies. They're no match for a Blue Fox. There must have been 100 or more fish in that little pond and in the 10 minutes that I fished it, I probably caught 20 of them. 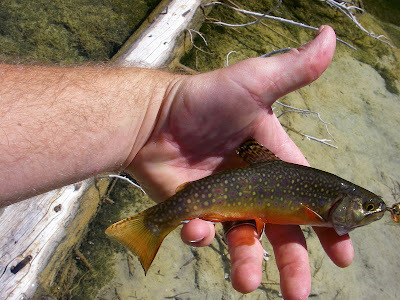 Great fishing for these colorful little treasures. 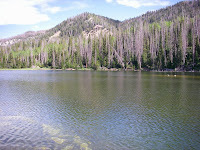 It's not a destination to plan a day around, but it's a great detour on the way to the next lake. 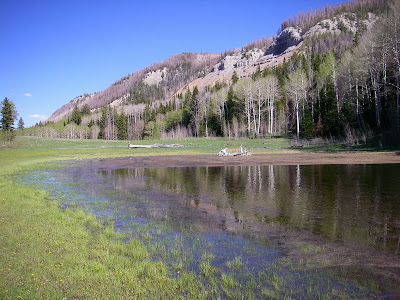 One of several Blue Lake's in Sanpete County, this particular puddle is full of prominently marked tiger trout and, so I've heard, some nice rainbows. 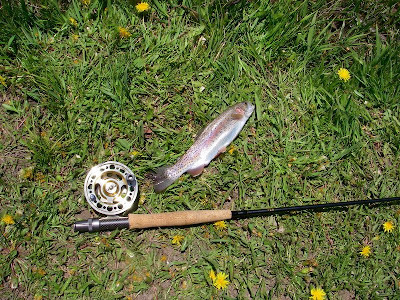 The stocking reports mention arctic grayling in one of the Blue Lake's, but I believe that to be a different one near Skyline Drive and further south. Such a gorgeous area. 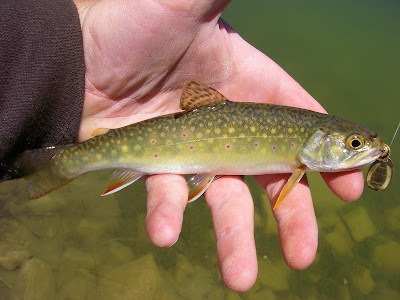 Even though I've had a lot of luck with a Blue Fox everywhere else in the area, the only thing I can provoke a strike with is some kind of olive streamer or marabou jig. Instead of turning to go to Grassy and Blue, Hwy 29 also leads deeper into Olsen Canyon, where more water awaits. Like the road to Grassy, snow drifts can linger into the summer. It can be tempting to try plowing through them, but it's best to wait. 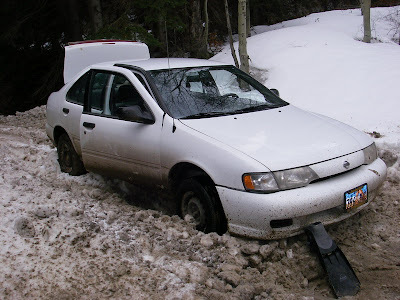 Once passage is possible, the road makes its way through densely wooded areas and runoff creeks. 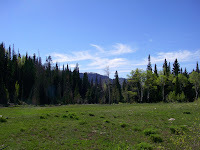 Once the road exits the thick of the forest, open meadows allow the beholder a view of the vast canyon. Such a gorgeous area is a pleasure to drive through. 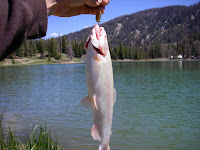 The signature water coloration of the region holds true to Pete's and the good fishing continues. 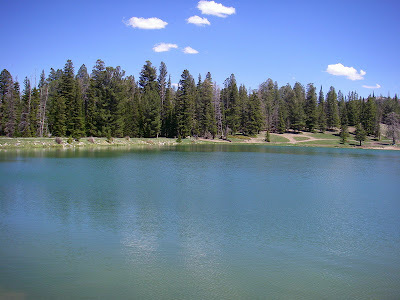 Blue Fox spinners, Jake's lures, and Kastmasters all produced fish from this gorgeous lake. 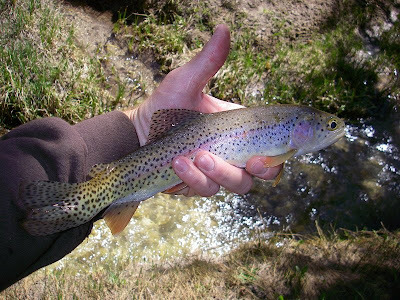 Rainbow trout, albino rainbows, tigers, and brookies (maybe even cutthroat?) all inhabit this water with many shapes and sizes to be had. 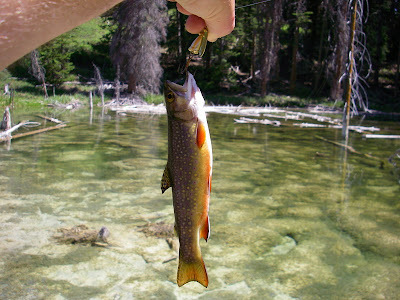 Most of the fish are stocked annually, but wild populations also exist in the system. Everyone I know that visits this area is in love with it and with good reason. Soup Bowl Reservoir lies just below Pete's, but the access road requires a high clearance vehicle. I hear good things about Soup Bowl, but haven't yet taken the time to check into it. At the end of the road to Pete's Hole, there's a small parking lot and a trail head leading to, yet again, more water. The sign reads, "Academy Mill Reservoir 1 Mile" and an old (now closed) ATV trail provides pedestrian and equestrian access to the beautiful south slope of Olsen canyon. Bears are known to live in these mountains, so any hike that's off the beaten path should be reason enough to bring along some protection. 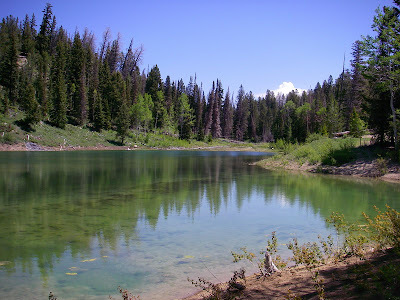 The trail is very scenic and is worth the trip, even without promise of fishing ahead. 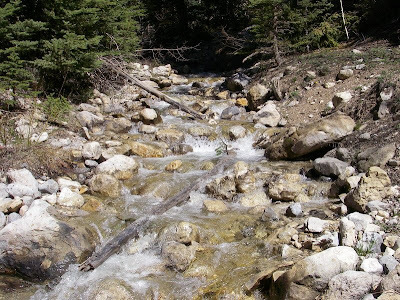 There's plenty of running water just off the trail and wild fish can be found if care is taken not to spook them. 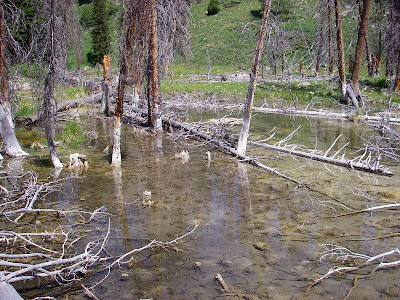 Trees and grass grow right down to the water line and many fish are visible from the shore. 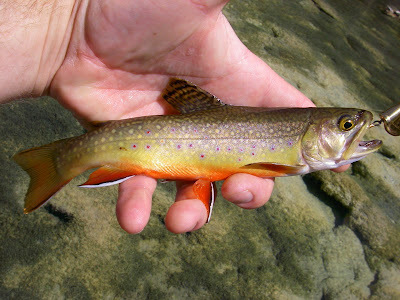 All types of lures and flies work well for these tigers and brookies. 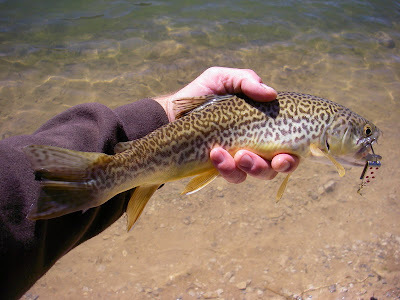 Most fish are about the average size for the area, but I've noticed a few larger fish that never bit. 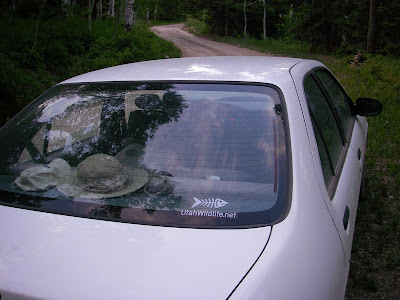 It's a very peaceful place to fish and the only other person I've seen has been a DWR conservation officer that jumped at the opportunity to take such a pretty hike when he saw my car at the trailhead. We had a good talk before he left me to continue fishing. My first time hiking into this area, I hiked too far and came upon the fishless Grass Flat Reservoir, which is little more than weeds and frogs. The maximum depth appears to only be about 3 feet. Mind the sign to Academy or you may also put unnecessary mileage on your feet. What's an extra mile in such beautiful country though? 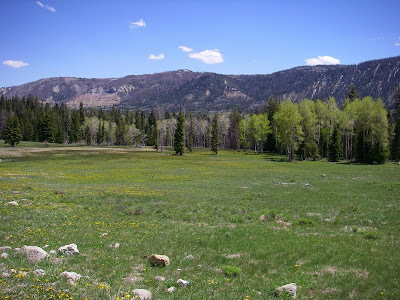 For those that continue past the turnoff to Pete's Hole, Hwy 29 eventually summits to intersect with Skyline Drive and then down Ephraim Canyon into the Sanpete Valley. 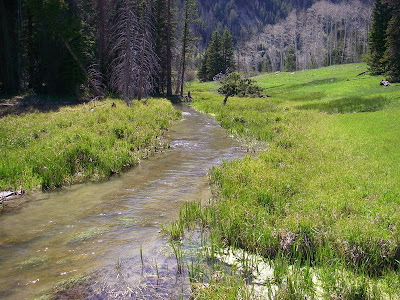 The experience of fishing the waters found in the area of Joe's Valley is a placid and humbling one. 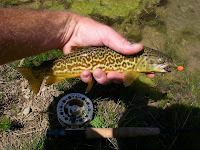 There are many places to fish and I would recommend visiting several before calling it a day. My best advice would be to slow down and don't be afraid to pull over and really get a feel for the surroundings in this awesome place. 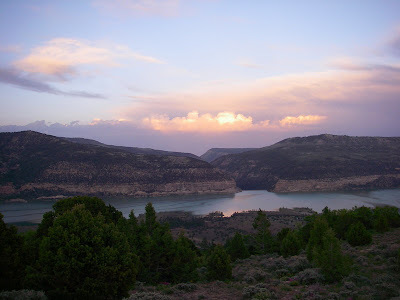 When exiting Olsen canyon on Hwy 29, a spectacular overlook of Joe's Valley bids farewell to another great day of fishing in Utah. My wife is from Ephraim (been married 2 years now) and I've looked at the maps over the past year wondering if any of those lakes hold fish. Next time I'm down there I'll have to go exploring.